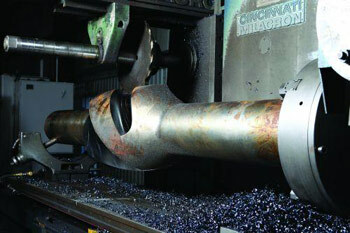 Arbor milling process Arbor milling the deep helical flutes in Reamco's integral-blade stabilizers generates approximately 250 pounds of hardened 4145 steel chips. In addition to lasting nearly twice as long as the previously used tooling, Ingersoll's RJLT button inserts have reduced cycle time by half. 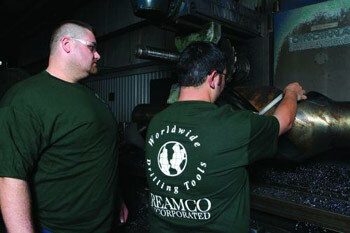 Reamco inspection Reamco lead mill operator Kevin Trahan and lead machinist Jeremy Arcotte check a completed part. Doubling throughput New Ingersoll RJLT button inserts need indexing only half as often as before. Each insert provides eight cutting edges. Protrusions on the bottom side mate with the cartridge seat to lock inserts in their positions. 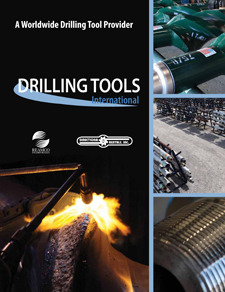 Downhole drilling equipment manufacturer Reamco projects that switching to RJLT cartridge-type button inserts from Ingersoll (Rockford, Illinois) for arbor-milling deep, helical flutes in hardened steel will save $250,000 a year in machining costs. 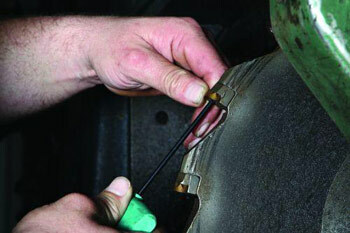 However, another benefit of revamping the troublesome operation is more important, says Brent Milam, company president. "The dollar savings are welcome, obviously, but the resulting improvement in delivery speed will probably matter more," he explains. "We've been in the downhole equipment business for more than 25 years—long enough to learn that even though we manufacture products, we're really a service business." That's why delivery speed was the chief concern when management challenged the production team to double throughput on the bottleneck operation in December 2011. Faster deliveries would be especially important in this case because the products in question, integral-blade stabilizers used to maintain control in bottom-hole assemblies, are a mainstay of the 50-man shop in Broussard, Louisiana. Despite their classification as standard products, these stabilizers are typically made-to-order in one- or two-piece lots in more than 20 sizes and styles. They resemble pieces of oil-well drill pipe with bulges in the middle that "ride" the hole wall to keep the string concentric and to control harmonic oscillations. Similar to those found on a common twist drill, the stabilizers' helical flutes provide an exit path for material ejected as the downhole drill penetrates the earth. 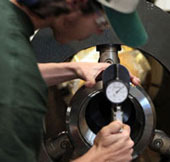 In most cases, they measure 4 to 5 inches deep and wrap 270 degrees around the large-diameter section of the part. On a typical stabilizer measuring 6 feet long and weighing 1,500 pounds, a fluting operation generates 250 pounds of chips. The heavy cut is especially difficult given the material: 26-inch-diameter sections of 4145H alloy steel drill pipe forgings hardened to between 31 and 35 HRc. "It's like hogging the cavity in an injection mold pocket, only the cavity is helical, continuous, and 4 to 5 inches deep," says Matthew Cazedessus, an application specialist with Ingersoll who worked on the solution. Craig Stanford, machine shop supervisor at Reamco, had contacted Mr. Cazedessus for help with the double-throughput challenge because Ingersoll manufactured the 16-inch circular cutter the company uses for the job. At the time, the supplier was just completing trials on a new series of inserts that Mr. Cazedessus thought would improve performance relative to the commodity button inserts Reamco had installed on the tool. Designed specifically for heavy cutting in hardened steels, the RJLT series inserts feature a free-cutting, positive rake-face geometry with negative edge prep for strength in hardened materials, as well as chipbreakers. More importantly, RJLT inserts are the latest addition to the company's Gold Rush grade. Gold Rush is a custom coating treatment designed to reduce micro-cracks and resulting stress raisers to create a durable, lubricious surface for lower cutting forces and cooler running. According to the company, smoothing the coating in this way provides longer, more predictable tool life in continuous and interrupted cuts as well as reduced adhesion, edge buildup and chip clearance problems in stainless steels and exotic metals. During trials conducted on Reamco's Cincinnati arbor mill in January 2012, the new insert improved throughput 2.2 to 1 and boosted tool life by 88 percent (see the table below for more details). 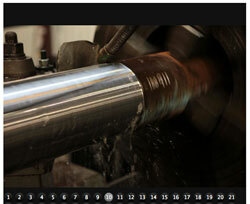 Shortly thereafter, the company standardized on the new inserts and machining parameters. "Basically, we slowed the surface speed, raised the feed and significantly increased the depth of cut," says Ingersoll's James Wilson. "Because Reamco's Cincinnati machine had the 'old-fashioned' high power and rugged frame, we could achieve simultaneous high-feed and high-depth milling." 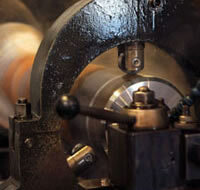 This approach contrasts with strategies often applied with high-feed milling tools, which were originally developed to increase metal removal rates despite the limitations of light-duty CNC machines, says Ingersoll's Bill Fiorenza, who worked on the solution from the cutting tool manufacturer's headquarters in Rockford, Illinois. "Traditional practice has been to feed fast, cut shallow and take multiple cuts, thereby protecting the spindle and machine frame," he explains. 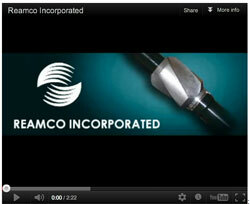 "Reamco's experience demonstrates that modern high-feed inserts have the intrinsic strength to withstand both high feeds and heavy cuts. 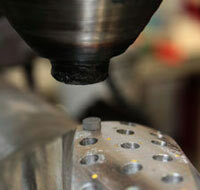 Any constraints on material removal rate stem from limitations of the machine, not the insert." Reamco tested the RJLT inserts on an integral-blade stabilizer with an 8-inch-diameter shaft; a football-shaped, 15.5-inch-diameter by 75-inch-long stabilizer section; and three, 270-degree helical flutes measuring approximately 4 inches deep. Note the shorter length of cut. According to the Ingersoll team, this is a result of an increased depth of cut, which enabled fewer passes and contributed to the tool life improvement.